After decades of antibiotic overuse, the crisis of untreatable infections has only deepened. Most major drug companies, squeezed by Wall Street expectations and facing steep scientific hurdles, have abandoned the development of new antibiotics. 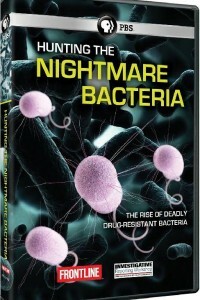 The film takes viewers behind the story of one major drug company’s efforts to overcome the new drug-resistant superbugs—and why, despite those efforts, the drug pipeline is running dry. Compounding the problem is the fact that these superbugs are now spreading in frightening ways with alarming speed, both across the globe and inside hospitals—though few hospitals are willing to talk about the problem publicly. The program gives viewers unprecedented access to the NIH, where some of the nation’s top clinical specialists struggled to control the spread of a deadly outbreak in 2011. The specialists remain confounded—and their experience has serious implications for the rest of the country: These new threats have been found in almost every state.